For years I followed my mother's lead and turned the grilling over to "the man." It does seem like a guy thing, but, like my father before him, my husband would stand outside in the the dark smoking and looking at the stars and come in half an hour later with burnt or still-raw offerings. So I finally stepped up and took on the grill. One of my favorite things to cook is this grilled salmon. Grilling fish can be a challenge. Its delicate, fragile flesh doesn't tolerate much handling. My trick here is to lay a whole side of salmon on the grill skin side down. Then I don't touch it until I take it off the grill. The smoke will turn the flesh a pale golden color. Preheat a grill. If you are using a charcoal grill, build your fire to one side of the grill. If using a gas grill, fire up the "back burner." You want heat and smoke but not direct flame, which can incinerate the delicate fish. Rub the flesh side of the salmon with some olive oil and season well with salt and pepper. Lay the fish skin side down on a rimless cookie sheet. Slide the fish off the cookie sheet onto the grill away from direct flame. Cover with the lid and grill over medium-hot heat until the fish is just cooked through, about 30 minutes. While the fish is cooking, make the green-olive sauce by mixing together the olives, lemon rind, shallots, parsley, anchovies, and olive oil in a bowl. Season to taste with salt and pepper. To test if the fish is cooked through, slip the point of a paring knife into the center of the thickest part of the fish. Remove the knife and quickly (carefully) press it to your lower lip. If it is very warm, the fish is cooked. Slide the cookie sheet under the salmon and between the flesh and skin, leaving the skin stuck to the grill. Use another cookie sheet or a big spatula to scoot the fish onto the cookie sheet. 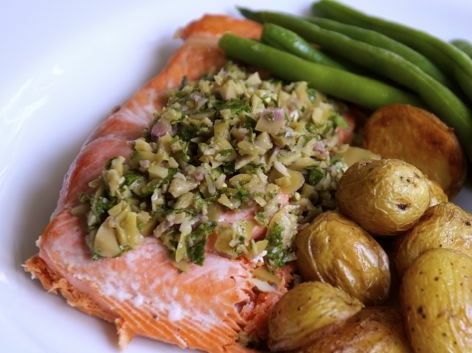 Slide the salmon onto a platter and serve with the green-olive sauce.